1. As an accomplished author, what advice do you have for those of us who want to pursue medical writing? How can I hone my skills, and what kind of publishers should I be trying to work with? Write about things you know and enjoy writing about. Know the audience you’re writing for, so you can adjust the level of detail and wording as needed. My goal for writing is to educate and inspire. Know your goals and share your voice and point of view. I often include personal anecdotes and patient stories (composites so it’s never giving away patient identity). I also try to make sure that everything I write or include in my work needs to be there. This happens in the editing. I re-read and think, “does this add value?”, “Does this need to be included?” and if it doesn’t meet my criteria, I delete it. I try to write almost every day. I write for my blog, for magazines, for my next book, for my IG posts. It doesn’t have to be long, but it should be consistent, and it should be substantive rather than “salesy” or commercial. As with all things, the more you do it, the easier it gets. 2. What advice do you have for establishing a media presence? Does your approach to traditional media vs social media vary? One way to fast-track a media presence is to hire a PR company to promote you. I have never done this because I don’t see the value in it and I don’t think being on TV is a critical factor in building a brand or growing a practice. I do all my own writing and social media posts and have never had PR or paid for followers. Your best bet is to be consistent and informative. This will get you noticed by magazines and media. It takes time but that’s ok because the results will be worth it. If your goal is to grow your practice, then write monthly newsletters and send to your existing patients. Most of us don’t realize how much we can gain from marketing to our existing database of patients and fans. You can also create your own YouTube channel, make videos and post them there. That’s how “DrPimplePopper” became famous. She made simple videos and has a great personality and message and it caught on. Now she has a TV show and a beautiful brand. She has stayed true to her values and supports always seeing a board-certified dermatologist. 3. For those of us who want to pursue aesthetics, do you think doing a cosmetic fellowship is necessary in every case? I think it’s helpful but not essential. When I graduated 20 years ago there was very little in the way of aesthetics, Botox hadn’t been FDA approved yet and there were no hyaluronic acid fillers on the market. Laser hair removal was relatively new and the two main lasers were ND:Yag and fully ablative CO2. Since then, and we’re talking only 20 years, there has been an explosion of products, devices and advances. Doing a fellowship can give you more access to these products and devices that you may not have if you go right into practice on your own and it will also give you access to mentors and leaders in the field who can teach you and help you build skills and confidence. If you join a group that has these elements and others in the group are willing to mentor and teach you then you don’t need to pursue a fellowship. 4. It seems like new aesthetic treatments are coming out every day. What resources do you use to keep current in regard to cosmetics? I read everything I can, and I speak with colleagues I respect. Every year, I also attend the ASDS meeting and am proud to now be serving on the Board of Directors for a 3-year term. I find that meeting is the most useful for updates on treatments and devices and most of the relevant companies also exhibit so I can see the devices and get more detailed information. It’s also a relatively smaller meeting which I prefer, and the presentations are incredibly informative. It’s also a great place to network with industry and colleagues. The WDS is another excellent resource. 5. My name is Dr. Vaishnavi from India. I currently reside in Miami. My husband is doing his abdominal organ transplant fellowship in Jackson memorial hospital in Miami. I completed my dermatology residency back home in India in 2016 & worked in a dermatology department before moving to Miami in late 2017. I was just wondering if there is any workshop/course I can attend to enhance my skills in aesthetic medicine during my stay in the USA? What would you advise a foreign dermatologist like me in terms of opportunities to explore in the field of cosmetic dermatology? One resource I find very helpful is Medsccape.com. There are videos of procedures and presentations that are non-biased and very informative. I would also look up Dr. Arthur Swift. He has courses that are the best I’ve seen. It’s not the same as The Aesthetic Blue Print, which he no longer works with and which I don’t recommend. 6. 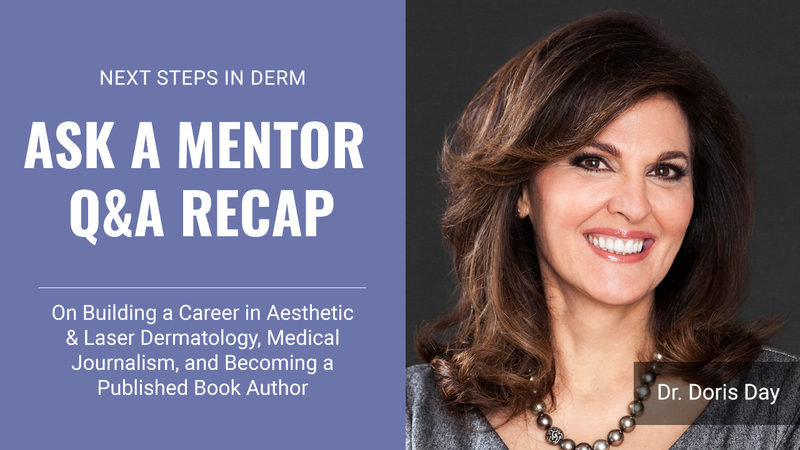 As an early career dermatology, I usually find myself saying yes to every opportunity for media engagements that come my way thinking the more the more exposure I get, the more I will grow my career. However, sometimes I feel I’m taking on too much and not necessarily saying any “return on my investment”. Do you have any tips on how/when to say no? How can you tell when media engagements are actually helping your career? It’s important to know your value. My position has been to always be positive. I never bash another product or celebrity, I focus on the good or an angle that makes sense to me. As for return on investment, I’m not sure what the expectation is. If it’s fame, that’s unlikely from TV appearances. If it’s patients, I don’t think that it brings in many new patients or loyal patients. Your existing patients may enjoy it and think more of you, but there’s also the risk that you’ll be seen as a “TV doctor” and not necessarily someone who’s good at what they do in the office or who will be available when they need you. The time can be an issue. If you have to close your office and travel to be on a show, that can be costly. I try to do shows that run before or after work- like GMA or news shows. If they want to tape in the office, I let them know the time I have available like lunch breaks. They can come in and set up in an exam room and then I do the taping when I have my break. I have turned down being on The Dr. Oz and other shows because I either didn’t want to close my office or because I didn’t want to speak to the topic they were covering. They got someone else, I was happy it wasn’t me. The biggest media help to my career has been my radio show on Sirius XM Doctor Radio Channel 110. I’ve been doing it for 10 years. It’s a live 2-hour show where I can tell stories, have guests and take calls. It’s been better than TV because there’s more time to go into detail. My goal is not to be famous, my goal is to be great at what I do and to be of service to my patients and to educate the public on topics I think are interesting and important. 7. What is the best way for residents or young dermatologists to get hands-on experience with laser devices? Most conferences have live demonstrations but don’t necessarily allow attendees to practice. The best way may be to do a fellowship or to visit offices that have the device. It’s not easy for any of us. I have the same issues when new products come to market. 8. Do you have any suggestions on how to deal with burnout? We are not taught how to cope with this during residency and I feel it taking a toll on my physical and mental health. To become a physician takes a highly motivated individual and we’re trained from a young age to do more, more, more but, there is a big difference between action and accomplishment. Just because you’re doing something, doesn’t mean you’re getting anything done that is meaningful to you, and that puts you at greater risk for burnout. As I’ve grown and as I’ve hit various milestones in my life, I have learned that by being efficient, and especially by being organized, I can get through a lot, learn faster and accomplish more with less effort. This leaves me more room to participate in a variety of activities and that also keeps me interested in the work I’m doing and at lower risk of burnout. I love seeing patients and that’s at the core of what I do, it always comes first. Around that I write, have my radio show, participate in Ad Boards of my choosing where I learn about and have access to products even before they are available to the general public, and I speak at meetings. I also do all my own posting on social media. What I’ve learned is the more I do, the better I do it and the less time it takes. I see all the different components as puzzle pieces not stress, and I find ways to make them all fit. If one piece doesn’t fit, I either don’t do it at all or I put it aside as something to consider for another time when it fits better. Another important component of avoiding burnout is to allow yourself time to decompress. I am always reading a good book, I walk to and from work every day, which is about 2 miles each way. I listen to music or just let my mind wander as I walk. It’s very refreshing and relaxing. I also leave myself time on weekends or when traveling to have quiet time and I try to leave time to work out. When my kids were younger, I made sure to have excellent support. My parents live in my building and we were lucky enough to have a great nanny, who remains as family even though my kids are grown and out of the house. The final message and I think the most important one is to be present. If you are able to be fully in the moment and not always thinking of where you have to be next or all the things you have waiting for you to do, you will get through so much more and you will find that it gets done more efficiently and with greater joy. The goal is to enjoy the process more than it is just to reach the goal for the sake of it. 9. I just passed the boards and am currently interviewing for my first job (private practice). Can you share what are the main things you look at when interviewing candidates? Do you have any Do’s and Don’ts for interviews that you can share? Congratulations on passing your boards!!! The good news, in 10 years you get to do it again! I just took my re-cert. Yuck. I have one associate who’s been with me for almost 11 years. We don’t have a contract and she is in full control of her schedule. She gets 50% after cost of consumables. If I get a discount, I pass it on to her. She works two days per week and takes time off as she likes. I have not interviewed anyone so I’m not sure what I would look for, but I would think that the main thing is to be able to work the hours you want, have some control over your schedule, feel that your contract is fair to both sides. I would look for someone who is motivated to work, who is not looking for shift work but is working to grow a practice and knows that takes time. Someone who is interested in staying for the long run, not building to a point and then going off on their own. I never understood that. I started on my own right from the start because I knew that was my goal. I worked two other jobs- at NYU/Bellevue and at the NYU student health center to have income and dropped those as my practice grew. Don’t think you can start with a packed office of all aesthetic patients on day 1. 10. My name is Dr. NERMIN ADEL. Female doctor from Egypt. I am 39 years old. I have taken training classes in cosmetic dermatology for the last few years from authorized scientific societies in Egypt. What is the accreditation of these training courses? I am a medical doctor, can this be considered as Diploma of Aesthetic Dermatology? Unfortunately, I’m not familiar with these courses and would not know their accreditation. The only accreditation I think is of value is from the American Board of Dermatology. There is no Diploma of Aesthetic Dermatology that is valid. Did you enjoy this Ask a Mentor Q&A Recap? If so, find more here.